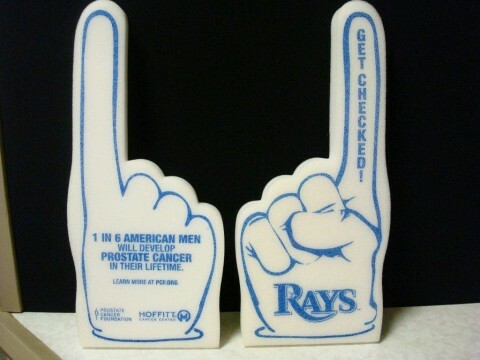 ST. PETERSBURG, Fla. SEPT. 17, 2012 – As part of September’s Prostate Cancer Awareness Month, the Tampa Bay Rays have partnered with the Prostate Cancer Foundation (PCF) and Moffitt Cancer Center to hand out “latex” foam fingers at the Rays-Blue Jays game on September 22 at Tropicana Field. The effort is intended to encourage men 40 and older to discuss all the risks and benefits with their doctor so that they can make an informed decision on prostate cancer screening. The Prostate Cancer Foundation (PCF) is the world’s largest philanthropic source of support for accelerating the most promising research for better treatments and cures for prostate cancer. Founded in 1993, PCF has raised nearly $490 million and provided funding to more than 1,600 research programs at nearly 200 institutions worldwide. PCF advocates for greater awareness of prostate cancer and more efficient investment of governmental research funds for transformational cancer research. Its efforts have helped produce a 20-fold increase in government funding for prostate cancer. More information about the PCF can be found at www.pcf.org. Located in Tampa, Moffitt is one of only 41 National Cancer Institute-designated Comprehensive Cancer Centers, a distinction that recognizes Moffitt’s excellence in research, its contributions to clinical trials, prevention and cancer control. Since 1999, Moffitt has been listed in U.S. News & World Report as one of “America’s Best Hospitals” for cancer. With more than 4,200 employees, Moffitt has an economic impact on the state of nearly $2 billion. For more information, visit MOFFITT.org, and follow the Moffitt momentum on Facebook, twitter and YouTube. The Tampa Bay Rays have proudly represented Major League Baseball in the Tampa Bay region since 1998. The organization and its foundation are committed to building a strong community bond through meaningful interaction and charitable contributions.